NickLannon.com: The Next Jeremy Lin Already? The Next Jeremy Lin Already? There's a Chinese player at Virginia's Oak Hill Academy (a school famous for producing NBA talent such as Kevin Durant, Carmelo Anthony, Rajon Rondo and Josh Smith) named Chris Tang. He toiled in total obscurity until those magical nights last winter when "Linsanity" struck New York. Now, good luck finding his name anywhere on the internet without an attendant mention of Jeremy Lin. Tang has been labelled, for better and worse, "the next Jeremy Lin." It's better for Tang now because his profile is exponentially higher. He has a much greater chance of attracting the attention of major college recruiters and NBA scouts now that he has a tie (fabricated though it may be) to an NBA success story. It's worse for Tang now because he must labor under the "next" banner, as we've discussed before in relation to Michael Jordan. 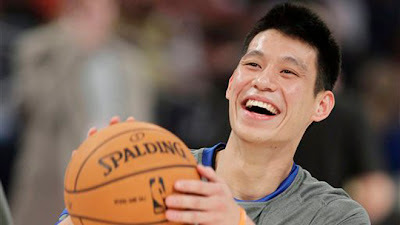 He can never just be Chris Tang, as long as there's a Jeremy Lin. Once Jeremy Lin became a referendum on all things Asian American, the next Jeremy Lin was an inevitability. And unless this Chris Tang makes it to the NBA, the next Chris Tang will be called Jeremy Lin, as will the next and the next and so on until a Chris Tang goes out and actually supplants the legend of Jeremy Lin. The great American underdog narrative demands a hopeful coda — when you come out of nowhere to inspire a people, the last shot in your movie will always show a bunch of kids running around a playground in your replica jersey. Reading this undeniably true description of the way in which the world works reminds me of Peter's description of the devil: "like a roaring lion, looking for someone to devour" (1 Peter 5:8). The law of "be the next Jeremy Lin" has devoured Chris Tang, and it will continue to devour Chris Tangs until one Chris Tang eventually surpasses Lin. But the law will not then be satisfied. It never is. It will merely morph into "be the next Chris Tang." (The same principle is at work in the "next player who needs to win a championship" discussion here) The law is a roaring lion, looking for someone to devour. But whence this lion? This can't be an infinite regression. It must have begun somewhere. Long ago, someone was the first "one you've got to be like." In basketball, it was perhaps George Mikan, the first "unstoppable force." In the world? It was God. The reason that we all experience an irresistible undertowing desire for perfection is that God is actually perfect. His law is a reflection of that. In the same way that a lion roars and prowls for food by its very nature, the law judges and condems. It can do no other. It is too holy, righteous, and pure, as a description of the Creator, to affect us in any other way. There is, unfortunately, no cure for the law. As Luther famously said, the quest for glory (i.e. perfect law-keeping and living up to the Jeremy Lin standard) can never be satisfied; it can only be extinguished. We humans are swallowed up by the roaring lion, which is then tamed by Christ, enabling us to leap, newborn in his form, from its now toothless maw.